Hospitality-trained Florian himself hails from the South-Brittany shores in Guérande, the region producing the renowned “Fleur de Sel” salt, which he used in Four Frogs’ crepes and their now-famous salted caramel sauce. 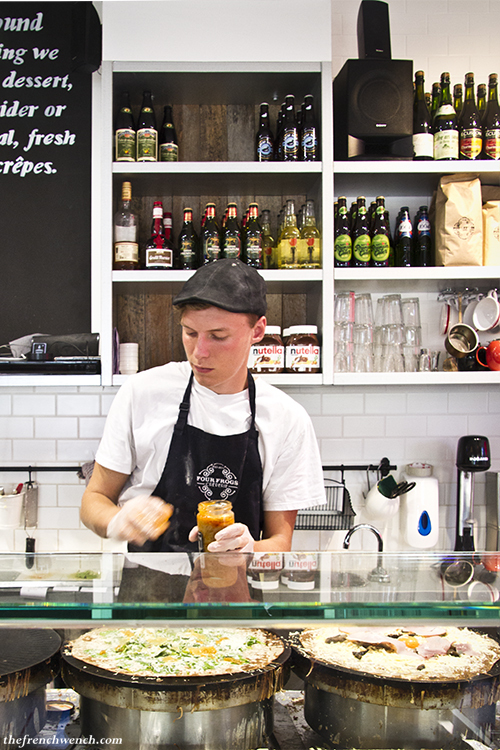 He settled in Australia 5 years ago with his Australian wife and immediately set to work on his crêperie project, as “crêpes and galettes are an essential dish in my life”, he says. 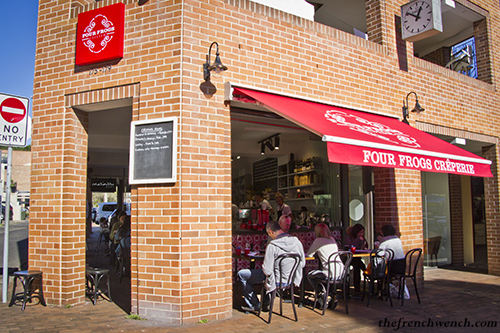 After a few years of making crêpes as “Chez Flo“, operating from Girdler’s Grind beachfront cafe in Dee Why, he associated with three other compatriots and opened last year their café/restaurant in Mosman, the aptly named “Four Frogs“. 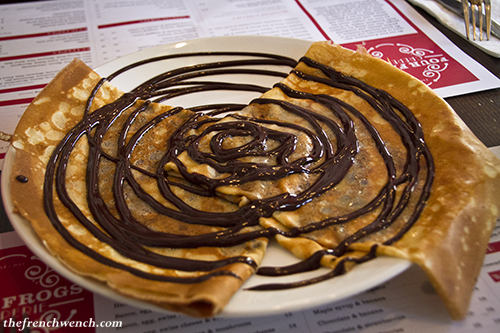 Crêpes are a specialty from Brittany, where you can find crêperies at at every street corner. 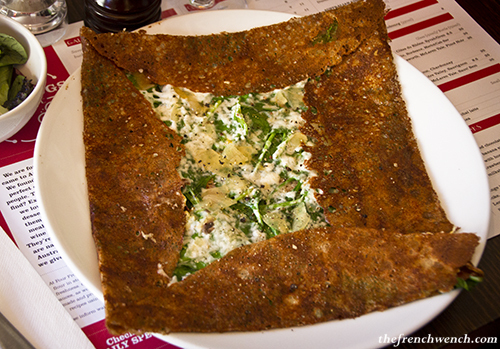 The savoury crêpes are called “galettes” and traditionally made from buckwheat flour (sarrasin) and Four Frogs pride themselves in milling their own organic buckwheat flour. They also make their own chocolate sauce from Belgium chocolate, and their own salted caramel sauce. 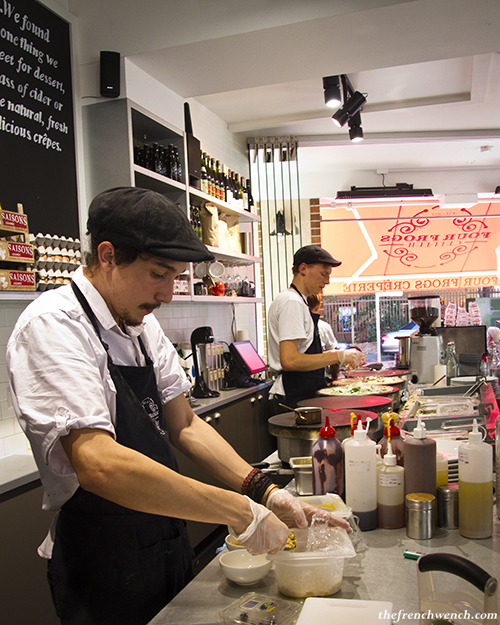 Even though Brittany is also very famous for its dairy production and delicious butter, a concession to tradition has been made by using the ever-popular Australian hand-churned butter Pepe Saya. The one time I bought some organic buckwheat flour at the supermarket to make my savoury crêpes, it was a complete disaster as the batter once in the pan kept splitting and making big holes that I had to fill… the crêpes ended up as 2mm thick, inedible horrors, so I was glad I would be able to taste a sarrasin galette made by professionals! There were a lot of combinations to choose from, but for me there’s rarely a better one than the classic Ham, Swiss cheese, egg and mushrooms ($13). Partner chose a galette from the Specials board: spinach, feta, slow-cooked onions in cider and avocados ($14). Crêpes are traditionally served with Cider, as apples grow abundantly in Brittany (they also produce the apple spirit: Calvados). 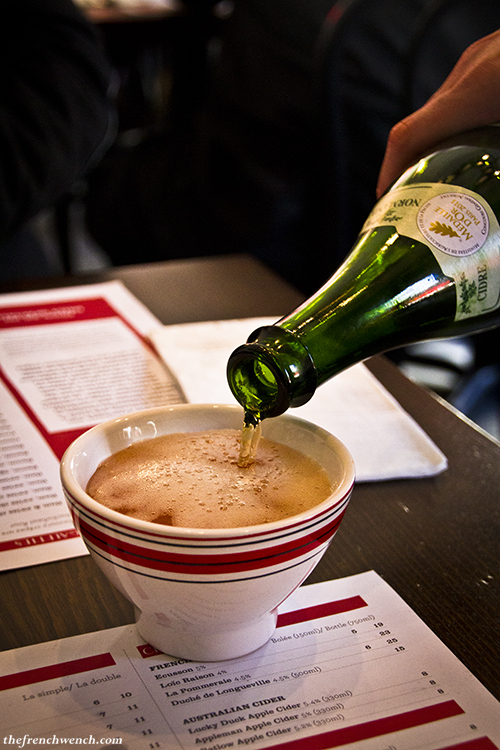 I chose the cider from La Pommeraie, which was served in a cute little bowl, as is the tradition in Brittany. I forgot how good French cider is: dry, a bit bitter and a bit earthy as well, it was delicious! The galettes arrived not long after nicely folded into squares, with mine showing off the pretty “mirror” (runny) egg yolk in the middle. (You can ask your egg yolk more cooked if you don’t like it runny… but that would be crazy I say!) 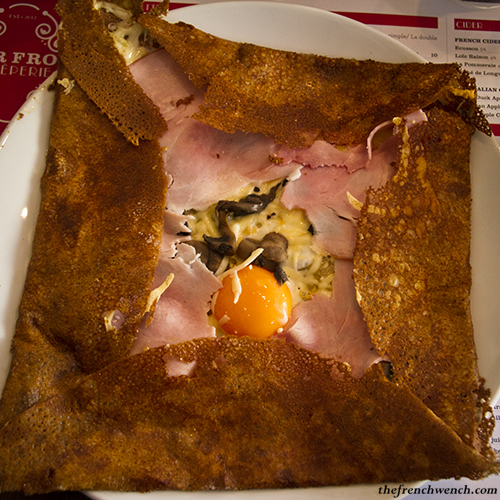 On the whole, it was a very nice galette and the egg yolk was perfectly runny. Despite the galette looking thin, it was actually a generous serve and I struggled a bit to finish it. Partner thoroughly enjoyed his galette as well, even if he would have preferred the onions a tiny bit more cooked. It was then time for the sweet crêpe, and again, there was a lot to choose from. I thought about choosing my favourite: sugar, butter and lemon, but partner twisted my arm to taste both the salted caramel & the chocolate sauce crêpes. You can order either a single or double crêpe, according to the stomach room you have left, and even though there wasn’t much in my case, we both chose the double. 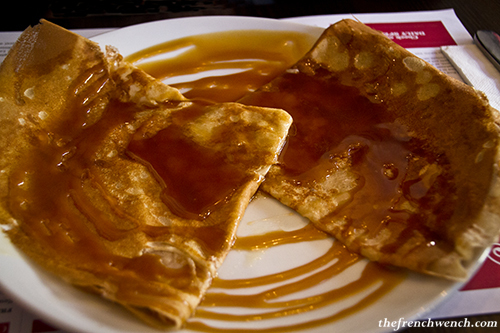 The homemade salted caramel crêpes arrived first, and they were delicious! We polished them off even before the lovely waitress had time to bring the chocolate ones. 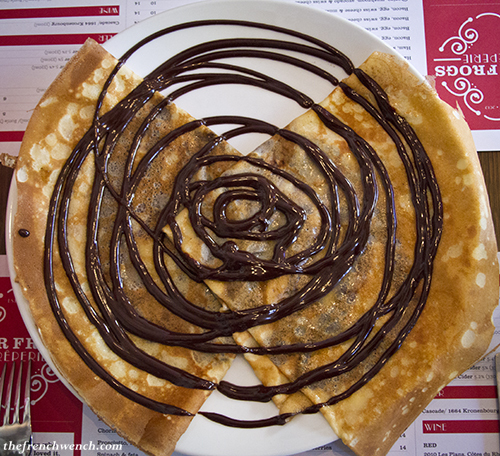 The Belgium chocolate ones were also very good, with the intense chocolate sauce generously lathered inside the crêpes and on top, which for me was almost a bit too much chocolate… something I never thought I’d complain about! 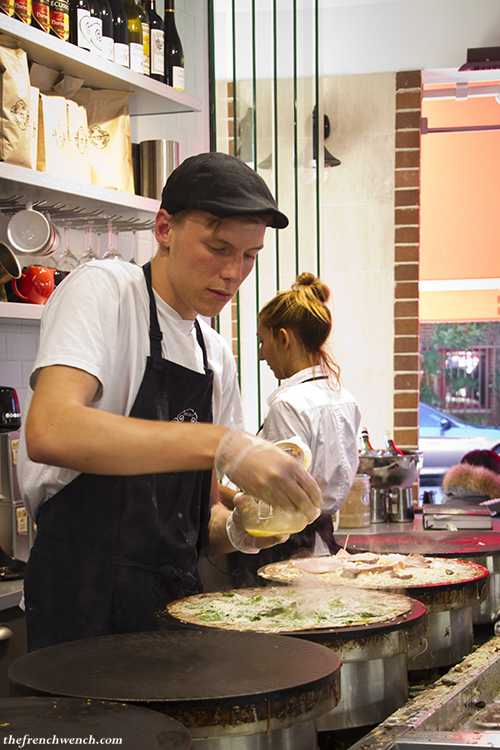 If you are after authentic and tasty Breton galettes & crêpes, Four Frogs won’t disappoint you. Maybe it is better for my waistline that Four Frogs in on the other side of the bridge, as I would probably spend way too much time there. My loss is the Northsiders’ gain! The French Wench had lunch at Four Frogs Crêperie as a guest. Fully licensed and now also open for dinner Thursdays to Saturdays. This entry was posted in French Specialties, Restaurants and tagged Brittany, Caramel, Chocolate, Cider, Crêpes. Bookmark the permalink. I also struggled to finish it. It have no problem eating a whole pizza but the crepe was huge. I liked ham and goat cheese, and scallop and cream. 🙂 I will try the place when I get back to Sydney. Looking forward to lunch tomorrow at Four Frogs, just down the road from my house! On y est alle pour mon anniversaire, apres avoir lu ta revue! C’etait delicieux! Comme en France! On y retournera, c’est certain.